Japanese fiction has assumed a position of significance in many genres of world literature as it continues to chart its own creative course. Whereas science fiction in the English-speaking world developed gradually over a period of evolutionary change in style and content, SF in Japan took off from a very different starting line. Starting in the 1950s and 1960s, Japanese SF writers worked to combine their own thousand-year-old literary tradition with a flood of Western SF and other fiction. 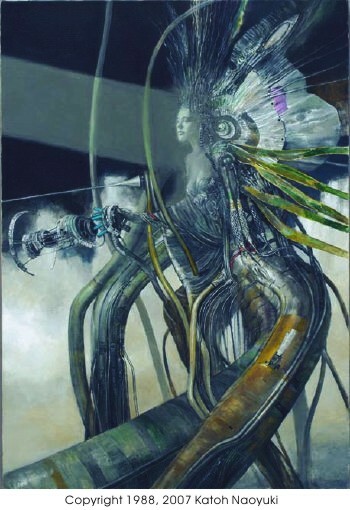 Contemporary Japanese SF thus began in a jumble of ideas and periods, and ultimately propelled Japanese authors into a quantum leap of development, rather than a steady process of evolution. The result has been phenomenal. As new authors developed in this exotic environment, they invented new ways to view SF, and used the genre to form new images of themselves and their culture. The time is long overdue to present the work of Japanese science fiction and fantasy writers to the world in English. We hope this shared world of speculative fiction produces a creative feedback relationship, which can only encourage new and more stimulating visions of tomorrow. ...the stories contained in Speculative Japan have less to do with either cyborgs or space than they do with hypothetical concepts. [...] A reader familiar with the type of tightly plotted sci-fi stories published in Fantasy & Science Fiction Magazine is in for a surprise with Speculative Japan, which - as its title suggests - is more about "speculative fiction" than "science fiction." [...] The actual stories in the collection are interesting and well worth reading, and a few of them are truly excellent. A number of factual errors in Speculative Japan have been brought to our attention by readers. We have issued an errata sheet to correct these mistakes. You can download it here. Books purchased from Amazon from December 2007 have already been revised to incorporate these corrections. Gene van Troyer was born and raised in Portland, Oregon. He has been writing poetry and science fiction since he was about 13 years old and began selling it professionally when he was around 20. He joined Science Fiction Writers of America as an active member in 1971, and has been a member continuously since. In 1973 Fred Pohl helped him connect with Shibano Takumi, and when he came to Japan in 1974 as an exchange student at Waseda University’s International Division, Shibano introduced him to the Nihon SF Honyaku Benkyō-Kai, after which he became a translation consultant to such translators and writers as Yano Tetsu, Shibano, Asakura Hisashi, Itō Norio, Imaoka Kiyoshi (Hayakawa SF Magazine editor at that time), Sako Mariko, Ōtani Jun, Fukami Dan, and many others. From 1975 through 1980 he had a regular critical review column of American science fiction in SF Magazine’s “SF Scanner” section, and continued to write reviews for SF Magazine through 1994. His own fiction and poetry has appeared in Eternity, Vertex, Last Wave, Amazing Stories SF, and Asimov’s SF. He is a past editor of Portland Review, a literary journal published by Portland State University, and Star*Line, the Journal of the Science Fiction Poetry Association. Most recently, he edited Collaborations: A Collection of Collaborative Poetry published by Ravenna Press in Seattle, Washington (2007). Gene van Troyer passed away in 2009. Grania Davis is a respected author and editor of science fiction and fantasy. In addition to her highly-regarded fiction, she has edited the posthumous work of the late, great Avram Davidson. She was introduced to Japanese science fiction in the early 1970’s by Judith Merril, who welcomed her as a co-editor for a projected anthology of JSF, and during 1979-80 she was resident in Zama, Japan, where she worked with members of the Nihon SF Honyaku Benkyō-Kai on a number of translations for the anthology. Her novels include The Rainbow Annals (1980), The Great Perpendicular Path (1980), and Moonbird (1986); and in collaboration with her former-late-husband Avram Davidson, Marco Polo and the Sleeping Beauty (1988), and The Boss in the Wall: A Treatise on the House Devil (1998). She co-edited (with Henry Wessells) Avram Davidson’s posthumous Vergil Magus novel, The Scarlet Fig: Or Slowly Through a Land of Stone (2005). Her Avram Davidson anthologies include the award winning The Avram Davidson Treasury (with Robert Silverberg, 1998), The Investigations of Avram Davidson (with Richard A. Lupoff, 1999), Everybody Has Somebody in Heaven: Essential Jewish Tales of the Spirit (with Jack Dann, 2000), The Other 19th Century (with Henry Wessells, 2001) and !Limekiller! (with Henry Wessells, 2003). Her short stories have appeared in numerous science fiction magazines, original anthologies, and best of the year collections. She grew up in Milwaukee and Hollywood, California, and has lived and worked at various times in bustling New York; on the slopes of volcanoes in Amecameca, Mexico and more recently in Rotorua, New Zealand; on a sandbar in Belize; in a Tibetan refugee settlement in the Indian Himalayas; near neon-lit Tokyo, where she worked as a military historian; and at the beach on North Shore, Oahu, Hawaii, where she graduated from the University of Hawaii. She currently lives in San Rafael, Marin County, California, with her family and cats, where she is working on a collection of her own stories, and editing and publishing Avram Davidson’s immortal literary estate.